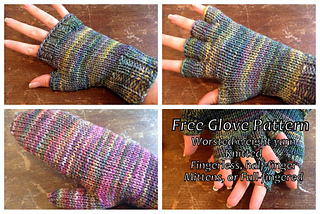 This pattern gives both written and picture instructions to create four types of gloves: fingerless, half fingered, mittens, and full fingered. The yarn needed is a worsted weight, I used Malabrigo Rios for all pairs that I knit. Size 4.5mm double pointed needles, or needles for magic loop. Pattern is given for a size 5.5-7 inch wrist. Instructions for sizing up to a 8 inch wrist are included. Please know that for the half-fingered and full-fingered versions are for average sized female fingers. You need to know how to knit and purl in the round to use this pattern. I also use K2tog, K1tbl to make one, and different bind-off methods for the ends of fingers on the full-fingered gloves. However I do provide a picture tutorial for these steps if you are new to them. Any product made from this pattern may be sold or used as you see fit!